I finished this piece a bit ahead of schedule!!!! It is fun to see this come together. I chain stitched a whole bunch of the segments together, which helped the assembly go much quicker. Here is one part of the chain! 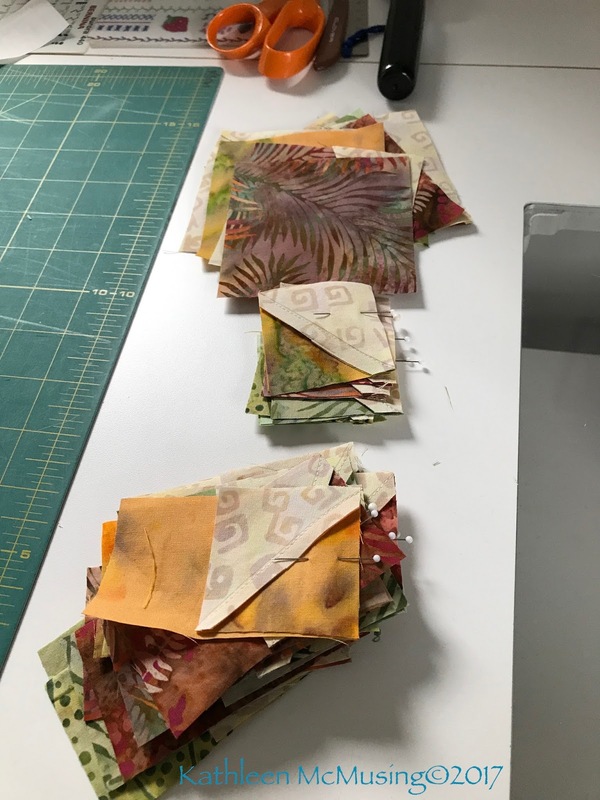 The first picture is of the pile on my desk, waiting to be sewn. 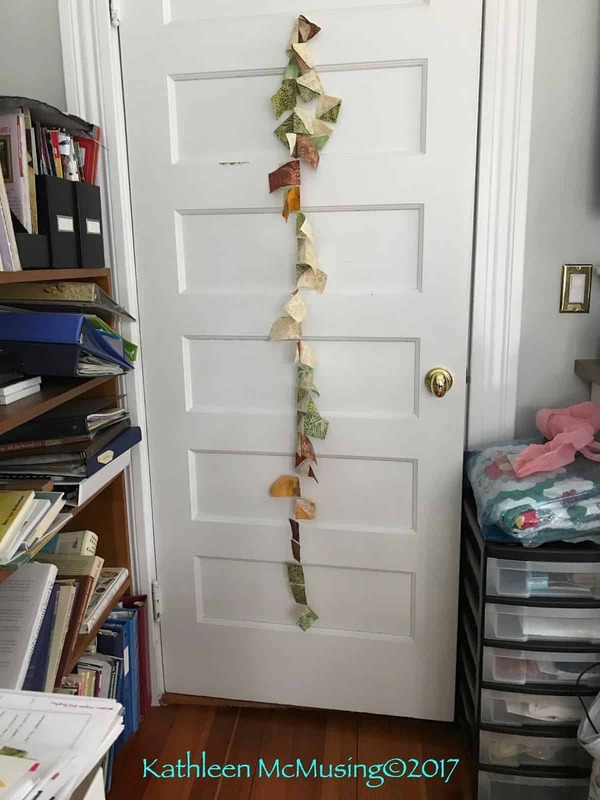 The second is the chain of that pile hanging on the door in my study! I thought that was pretty entertaining. On the whole, I have figured out that having a system of organization for this is making me much happier. Many patterns have pictures of the units, and while I don’t really need them, I had to come to some easier way of putting this block together. 1. Mark and make the half square units. 2. Pin all the pieces that can be sewn next (one flying geese unit, 3 half square-rectangle units, one half square /square unit), so that the pin is on the side to be sewn (saves pieces getting turned and piecing on the wrong side). 4. Pin next set of sections, sew and press. So much happier putting this group together!! Previous Post A finished table runner from scraps! Your progress looks great! 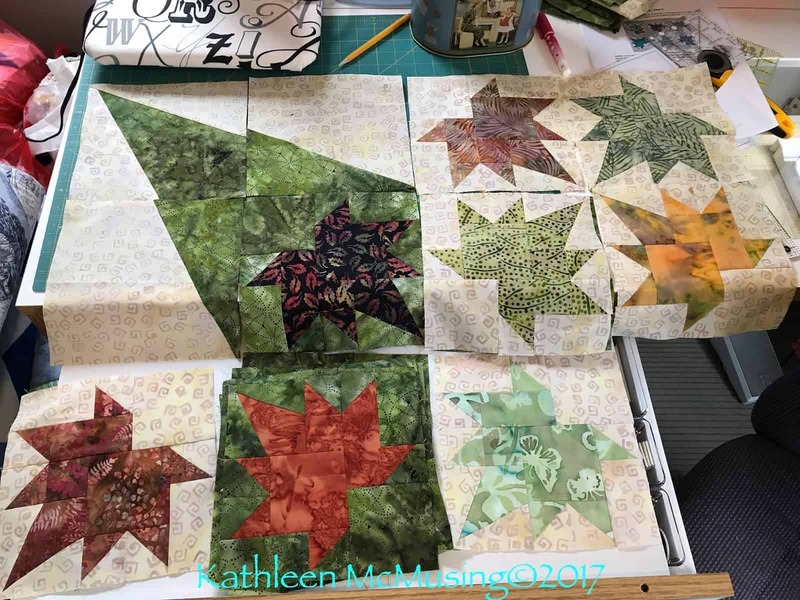 I need to work on my blocks this week before I fall behind! Thanks, Yvonne. I look forward to seeing yours soon. Great progress! I love the colors you are using on your leaves. Thanks, Cheryl. They are more fun this second time. Love the chain hanging on the door!!! Thanks, Nancy. It was fun to see how long it was. Your leaves are beautiful with the batiks you have chosen! Nice progress!